Hello everyone! Seeing all the beautiful photos and looks fellow bloggers shared with you, I am sure you haven't missed me. Just to let you know though, I am back! I had an amazing time and crazy hauls, so expect to see some Japanese make-up in the coming weeks. I am fighting with jet lag at the moment and sometimes what I say/write doesn't make sense. Nevertheless I will try my best today to bring Kumano, the brush city of Japan to you. A few minutes before 7am we were rushing to the breakfast buffet at our hotel in Kyoto. I ordered the Japanese breakfast set as my husband enjoyed the croissants which were offered with the western style breakfast. Nevertheless I stole his bacons and add on my rice. On a short notice we managed to reserve seats for Shinkansen to Hiroshima and train leaves at 8:27am. 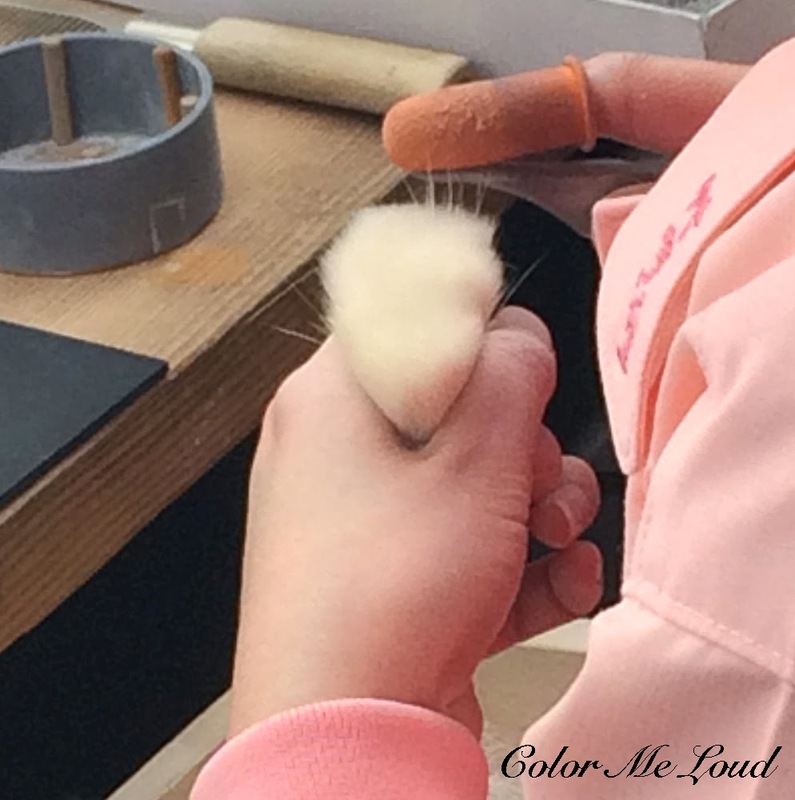 I couldn't wait to see how softest brushes come alive in hands of brush artists. Needless to say we were so excited. 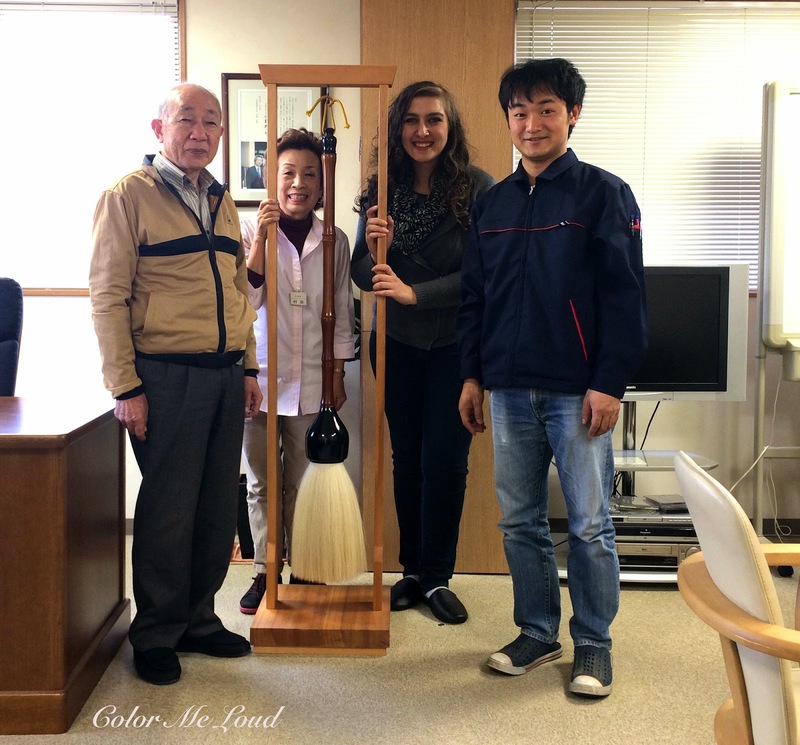 Chikuhodo was kind enough to invite us for a tour to their factory in Kumano. After the fastest breakfast ever, we caught the subway to Kyoto main station and let the adventure begin. Yutaro Takemori, the son of CEO of Chikuhodo, Shin Takemori was kind enough to pick us up from the train since it is a little tricky to reach Kumano by public transport. He can speak English very good and explained us every step of the procedure and answered all our crazy questions. Many thanks to Yutaro for taking his time for us. 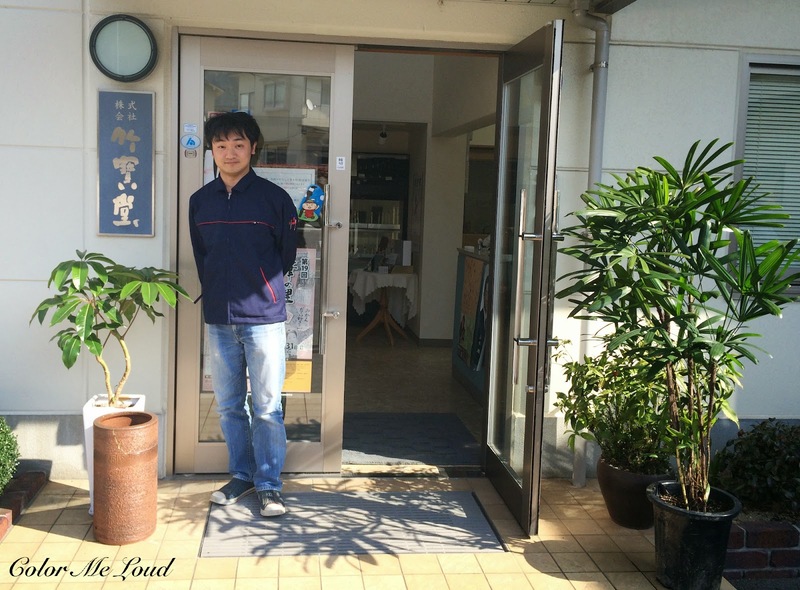 Yutaro Takemori in front of the door of Chikuhodo factory store. To see how the brushes are being made was another dimension of knowledge. It certainly changed the way I look at and examine brushes. This is why I would like to share it with you and hope you will enjoy it too. Everything starts with hairs. The hairs are aligned as shows below and one side of the hair is left uncut since the natural end of the bristles are softer and not scratchy. The long band in this machine aims to mix bristles in a homogeneous way and has to run several times to assure that they are nicely mixed. This procedure is needed for brushes made of more than one type of hair, such as goat and squirrel mixed. 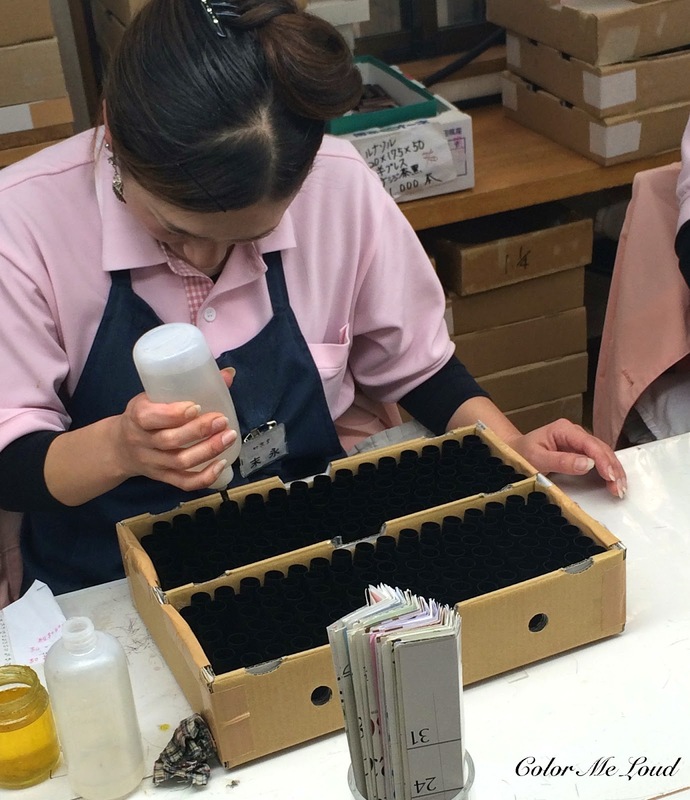 But Yutaro explained us also for the brushes which are made of one particular type of hair, this is done to assure that the end quality doesn't get effected by a batch of hair which was different than the other batches. So typically different rows are being mixed. By means of a special knife, a very well trained worker can skim the bad quality hair as well as ones with wrong directional. It looked like a very hard thing to do given you only have one tool. Yutaro told us that one needs several years to learn to apply this step . 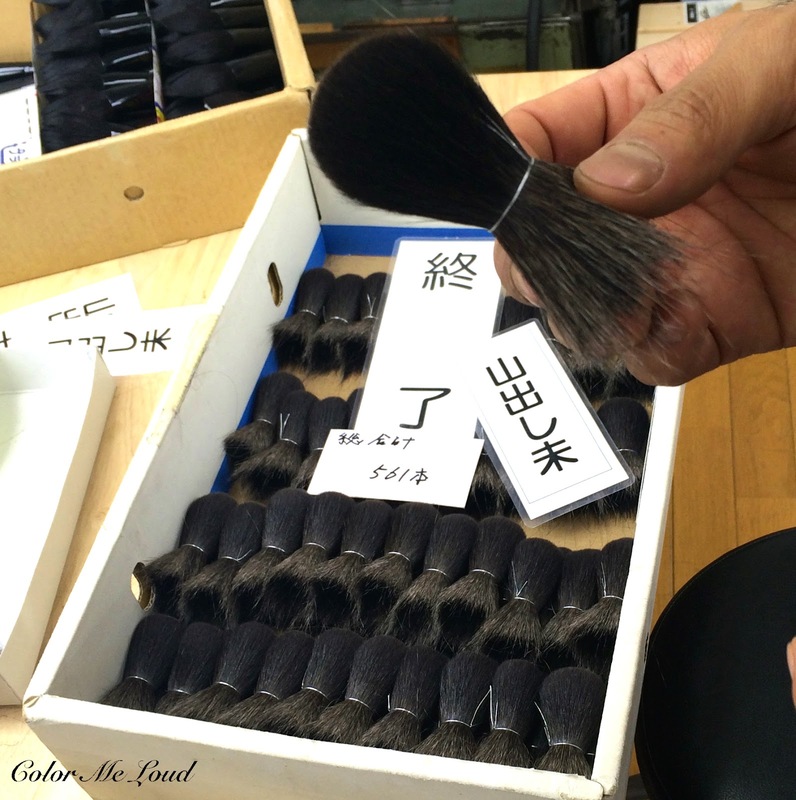 Making of Japanese Brushes: Seperating the wrong ends or bad quality hair. Here is a video to show you how much care has to be given to each and every brush to make sure the bristles are all aligned and have the same thickness. Below you can see a batch of hair before and after this procedure. It was amazing to see how much difference it makes. Since the ends are not supposed to be cut, this step is very crucial to a good crafted hand made brush. 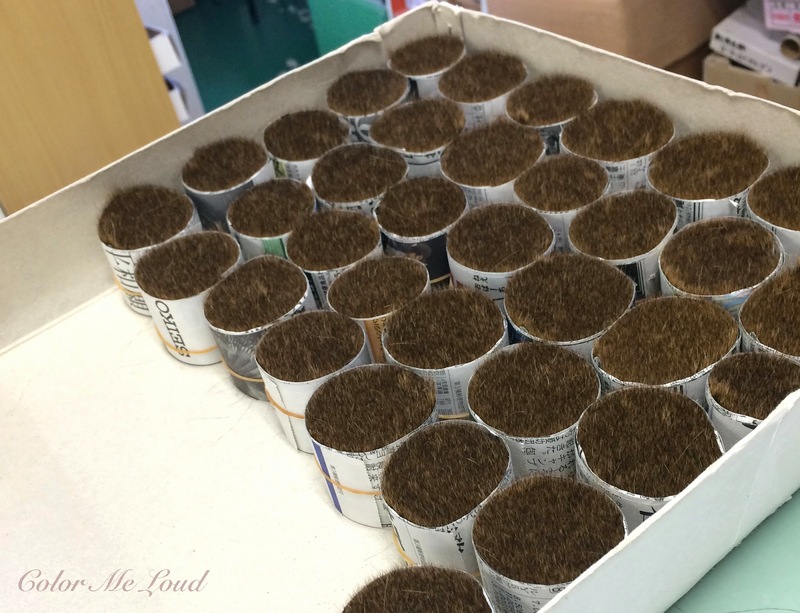 After hair is mixed and grouped, it is time to give them some shape. 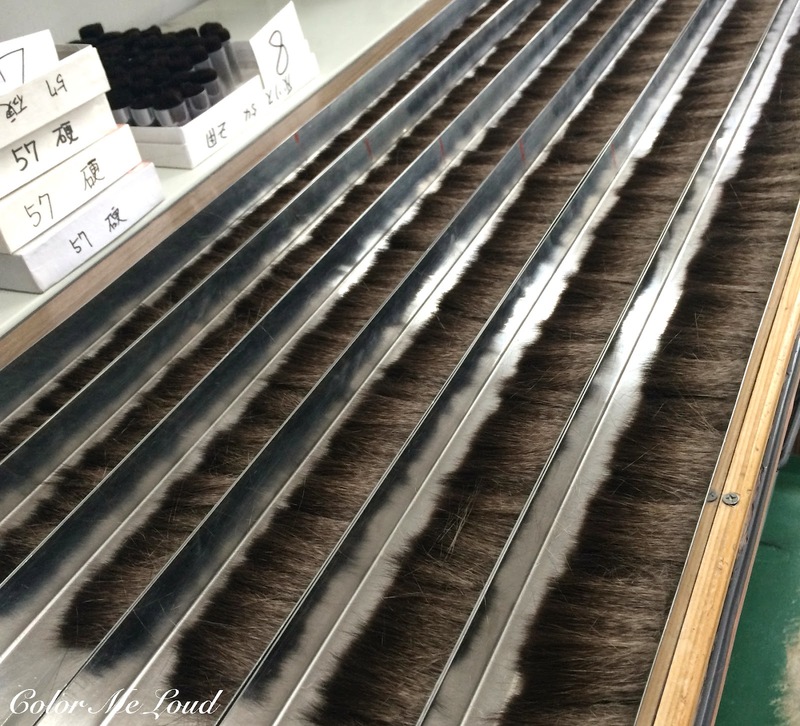 For each brush there is a mould which is designed and realized in the factory as well. 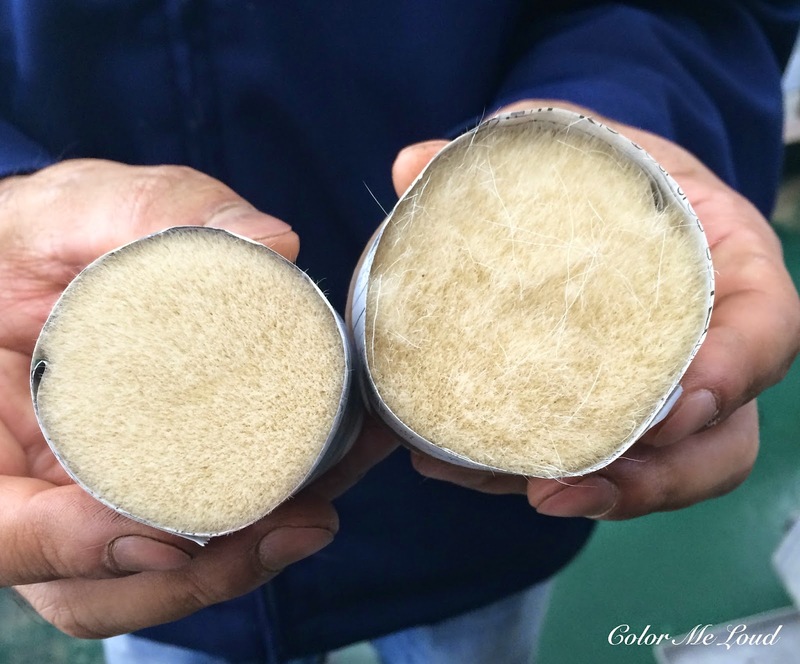 The bristles are lied inside the mould before they are tied. Below you can see the moulds for a powder (top left), a cheek (top right), an eye brush (bottom left) and an eye liner brush (bottom right). After the hair is shaped using the mould and tied by a string as shown below, the end shape has to be given to the brush. This step is done exclusively with hand. You can see that the tied bristles are always round. So for flat brushes this has to be modified by rolling the batch as shown in the video below. At this point we also asked how they managed to make an "angled brush" out of this straight round shape. It turns out that by the way an expert rolls it, it can also be turned to a angled brush. Since the bristles are now ready, it is time for them to marry their long awaited ferrule. 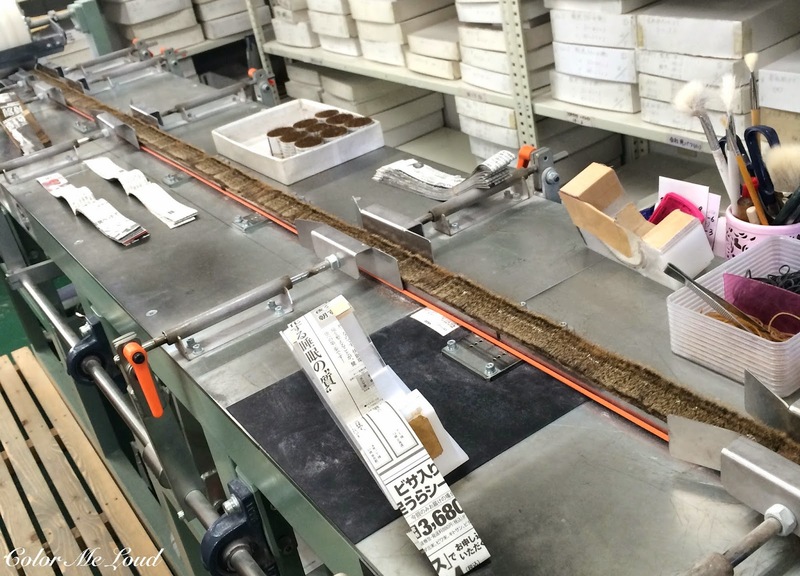 At this step the ferrule is being prepared by inserting the right amount of glue inside. There is an interesting step how bristles get in the ferrule. I made a video of this one for you. By means of a string, they are pulled and fixed. 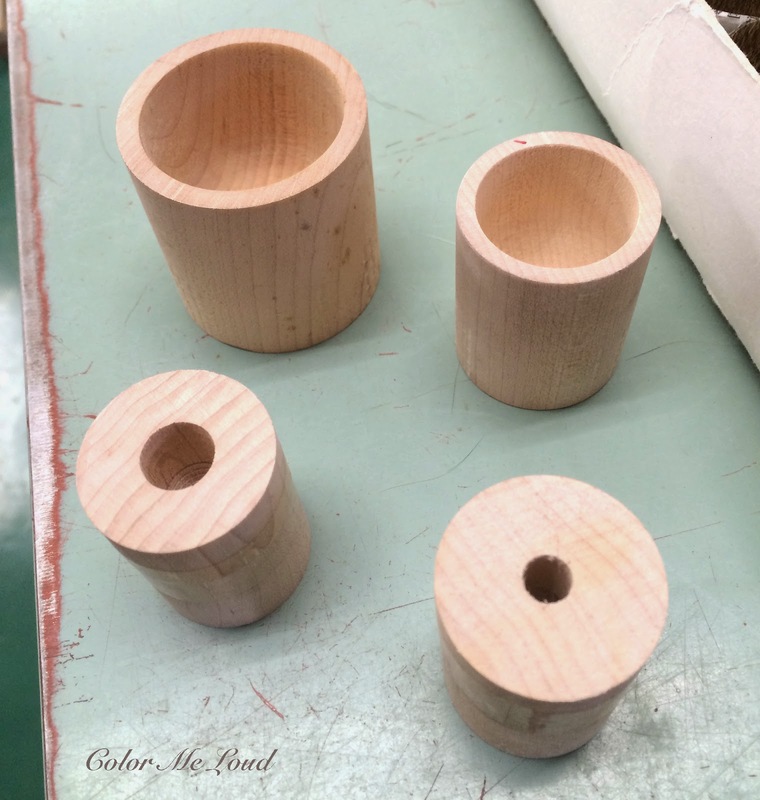 After the bristles are in the ferrule, now it is time to marry them with the handles, which is being done in the photo below. This is the end step of your cuddly soft brush. 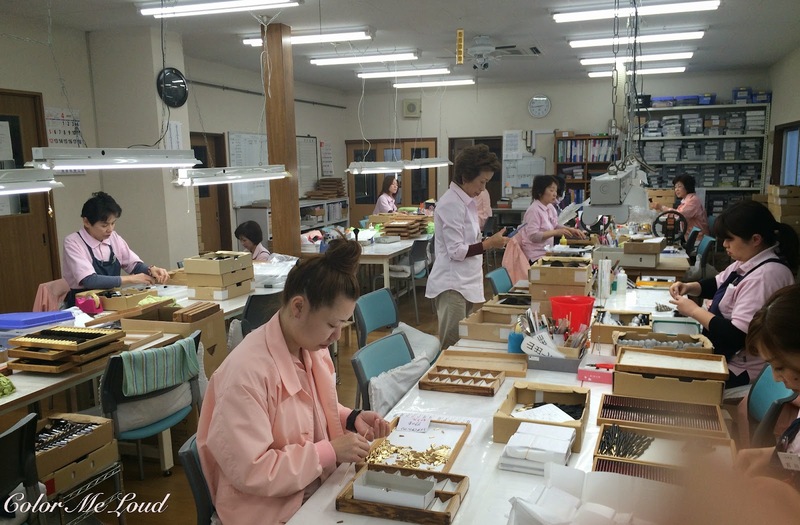 More than 100 people work for Chikuhodo Kumano factory, most of them are women. They provided us such a lovely cheerful company. If you ever drop by Kumano, you can go to the factory shop and get to play with all the fluffy brushes. I think at this point I was loosing myself, good that hubby reminded me that I can't buy everything. I tried to be reasonable but it was not easy. I am sure you can relate. I will review the brushes I have picked up soon. I have already shared the spring set with you at Instagram. After the tour I had the pleasure to meet Chairman Tessyhu Takemori who is the one to start the mass production of Chikuhodo make-up brushes in the beginning of 1970s and the artist behind the new creations such as their Noel Limited Sets for Christmas and many more. I would like to thank Chikuhodo family for their warm welcome and their time and hospitality. It was an unforgettable day in Kumano. As I mentioned earlier, to see the production of brushes changed the way I look at them for good. Now I can appreciate a good aligned and nicely shaped brush. Each time we asked a question, we could feel how detailed each step has to be planned. From where to tie a batch to how to roll and how to fix the handle, there are countless details to consider for each brush, depending on the brush type and hair mixture type. I hope this was a helpful tiny review for those who would like to dive into the world of brushes a bit deeper. Oh, I have just seen this, now CD Japan is selling Chikuhodo as well, and the prices are the same as at Chikuhodo's website! As a reference Chikuhodo Z-2 Highlighter brush is 7000 JPY at Chikuhodo Website and 7000 JPY at CD Japan, which delivers internationally. 7000 PJY is around $60 at the moment. The same brush is $78 at Beautylish website, who has to of course import the brushes and has probably additional costs. Remember you may have to pay additional taxes and shipping depending on your location so check out which of the options are better for you. For those of us in Europe, I believe CD Japan would almost always be a better deal. This was so interesting! I don't own any Chikuhodo brushes but I've read very good thigs about them. I definitely have a deeper appreciation of the craftsmanship that goes into good-quality brushes! Welcome back! I do have some Chikuhodo so it's fascinating to see all that goes into making them. Omg! Thank you for sharing this incredible experience with us. The Chikuhodo hospitality sounds wonderful too. I've known the incredible work and craftsmanship involved, but my appreciation had been even more greatly intensified thanks to your post. Amazing, Sara!!! I've always wondered about the process of creating a brush and your post is so illuminating!! Thank you for all the pictures, videos! and descriptions! Looking forward to seeing what else you picked up! What an interesting read!!! So awesome, thanks for sharing Sara! glad you liked it. I found the process so interesting. I always appreciated hand crafted brushes but after seeing this I have even more respect. What I picked up? You don't want to know. I am afraid to check my credit card lol. which is your favorite Chiku? Chikuhodo is one of my favorite brands, probably my favorite from brush suppliers. LOL Sunny, yes the right word is insane! They are soft and fluffy and the quality is to die for. I am glad to read that you found it interesting. I was actually checking a few brushes which I didn't use all that much lately, like Shiseido's squirrel face and cheek brush. Now I know why I don't like them, because they are not aligned perfectly! SO it is not only the hair but how it is brought together. Wonderful and informative post, Sara! 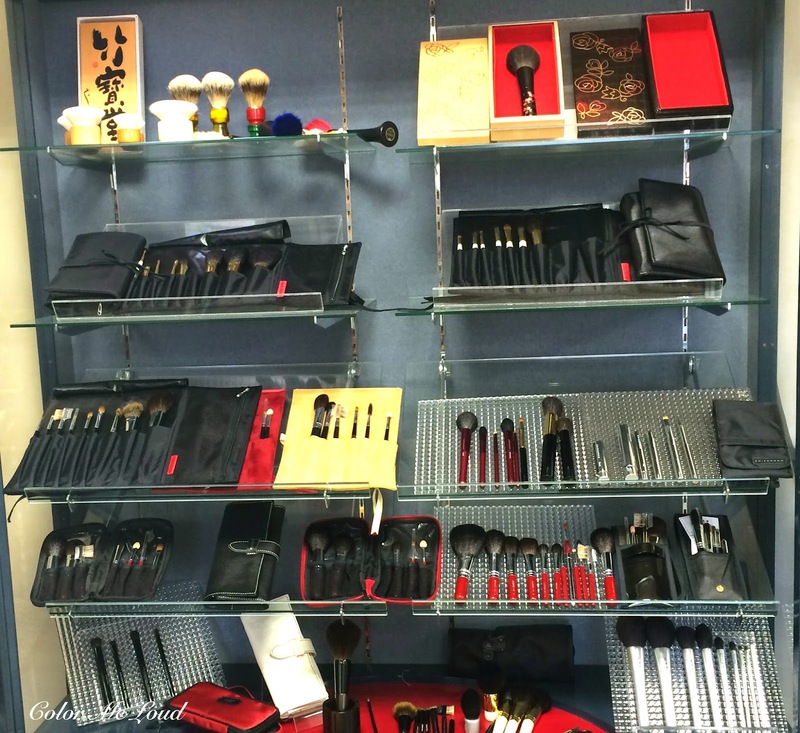 I discovered Hakuhodo several years ago and have gone on to explore other Japanese manufacturers as well. The Japanese have perfected the art of makeup brushes to the point where if it isn't Japanese, I don't even think about it. I now have an extensive collection of beautiful, well-balanced, efficacious, ultra-soft makeup tools that come from some of the very best of the best Japanese brush manufacturers. To the uninitiated, it can be terribly confusing because fine, handmade Japanese brushes come in so many shapes, styles, and types of hair. Some are better suited to certain skin conditions than others. Some are better suited to certain types of products than others. Some are better suited to certain application techniques than others. Etc., etc., etc.! Fortunately, the Japanese are justifiably proud of their superlative brushes and are happy to help customers select the perfec brushes to meet their needs. As for people who avoid natural hair brushes because they re cruelty-free advocates, many of the manufactures actually create cruelty free, natural hair brushes :-). 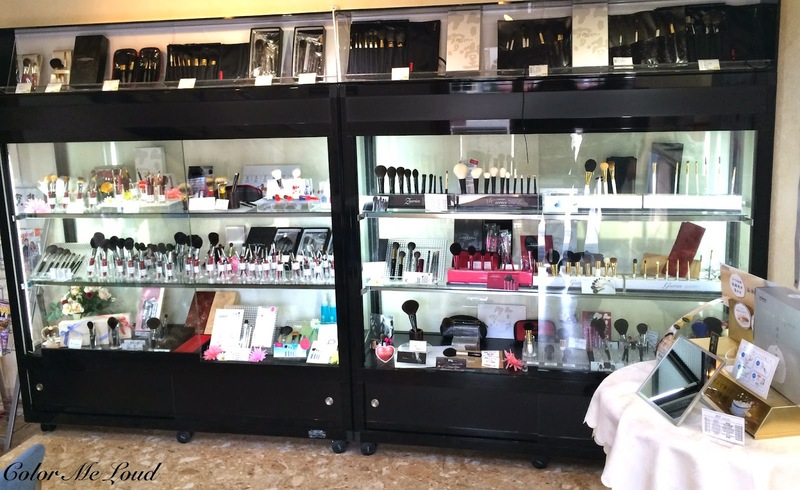 Wayne Goss' collection is a good example. The discussion about being "cruelty-free" is a hard one though. I asked this to Chikuhodo explicitly. Their answer was very honest. The hair in each brush comes from a dead animal. So it is an illusion to think that no animal was killed in the process. And there is one more fact, all the hair comes from China, where animal rights have, say, another standard. These are two facts for most of the brushes which are produced in Kumano. Wayne Goss brushes are also made in Kumano, so I don't know what the difference can be other than Wayne being not all that honest. Chikuhodo says they make sure that the animal is not killed for this purpose but it is already killed for something else, so the hair for the brush shouldn't be the reason for the murder and it is a side product which would have been tossed away otherwise. In this case they believe to honor it by making this brush so that it continues to live forever. So it all boils down to, what is the definition of cruelty free? Hey Sara I have never received a straight answer on what cruelty free actually means when it comes to Japanese brushes. I had no idea the hair came from China though! I heard once that Hakuhodo just brushes the animals and uses those hairs so that its cruelty free (i think it was on Sonia's website). I do wonder how Chikuhodo can make sure the animals aren't killed for brushes though...why else would the squirrels be killed, especially the more rare types? I have a hard time with this because I'm an animal lover. But I also honestly feel that Japanese brushes are unrivaled in terms of quality and application, so if I had confidence in the cruelty free claim, that would be better for my conscience and probably horrible for my wallet if I'm honest. Hi Eileen, I can't agree more to what you say about "cruelty free" being used as a marketing term but very few people ask the real meaning of it. This subject is really very very deep. I would love to go deeper in there once I have the time and start a conversation here. Thanks so much for your helpful insight as always. When I first heard how much these Chikuhodo brushes can cost, I rolled my eyes, but now I see why. Thanks so much for the informative post. A Chikuhodo brush has now been added to my bucket list. I'm at least glad to know that they didn't try to hide behind marketing language and admitted that the fur comes from dead animals, but as far as I know, squirrels aren't farmed in Asia for any reason other than their fur, so I think it's pretty much a given that they aren't being used for anything else. I don't think the term cruelty-free is so confusing. To be truly free of any kind of cruelty, a product would have to be made without any animal exploitation. It's like saying a food is peanut free. I think what's confusing is that people have different standards for what they're willing to tolerate on the "cruelty spectrum". For my part, I can't stomach the fur industry, but I don't have a problem using products that contain beeswax or lanolin, which are produced by living animals. Those are personal boundaries, but those choices absolutely wouldn't fit within the definition of "cruelty free". I've really been looking forward to reading your post with your brush factory experience. In true Sara style you have described everything perfectly so we've had the chance to learn too! Thanks!! It was fascinating and I'd love to try some of these amazing brushes. I'm going to wait to read your reviews to make a list, maybe for the future! THE FERRULES AND HANDLE SEEM DIFFERENT TO THOSE ONLINE. DO THEY USE A STANDARD MATERIAL FOR THOSE?